mushrooms — you are worth it! Cooking has never been my thing. I eat simply and value convenience over quality and even taste. For as “healthfully” as I think I eat (vegetarian, organic, grains and fruits), much of what I eat comes from a can, box or bag. In the past couple of years, a shift has happened — or very small, incremental shifts toward more awareness around what I eat, how it is prepared, where it comes from, and what waste the packaging generates. This started with some dabbling in Ayurveda (choosing foods and flavors in response to one’s unique constitution, needs, the seasons, and more) and culminated this past fall when I participated in a “Healthy Living Cleanse” — a 28 program that eliminates inflammatory and allergenic food categories like dairy, gluten, sugar and caffeine. Participating in the cleanse was not easy or particularly fun. However, it was valuable enough for me to do again this April. #1. Address the irony of taking great care of my exterior and often abusing my interior. I take pretty good care of my exterior: walks, bike rides, asana, along with other primping and pruning make for a fairly happy body. This does not match the quality of what I eat. #2. Awaken my senses and appreciation of pleasure. After all, my word this year is affluence. I’m beginning to value flavors and textures and the mystery of combining ingredients to create a new and magic product. It’s delightful. #3. Slow down and spend time on myself. This one probably holds the most potency. I tend to be, shall we say, focused. There’s probably also a little self-worth, laziness and entitlement wrapped up in here, too. To plan a meal (from grocery shopping to table) takes effort that says You are important, you are worth this time. That’s a powerful message. 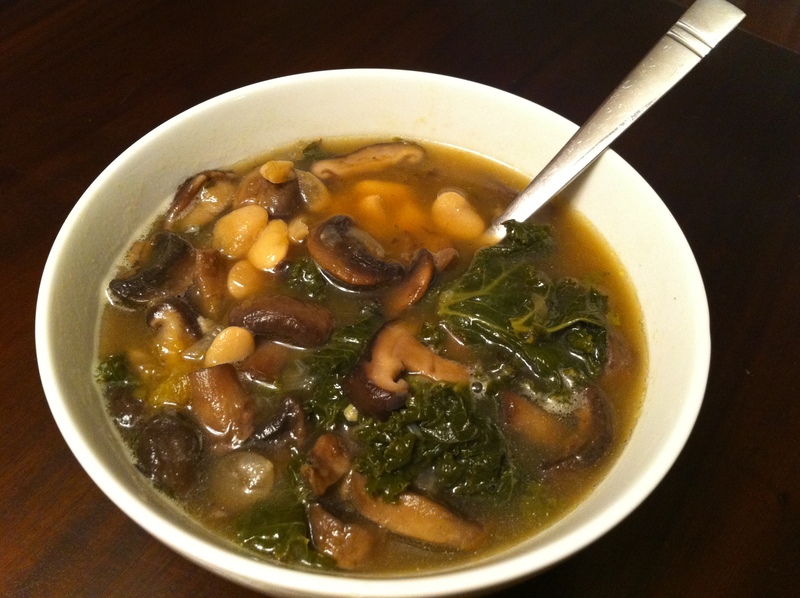 Last week I posted on Twitter that I was making mushroom-lima bean-butternut squash-kale soup and ears perked. Apparently mushrooms are popular. So here you go: easy to make, good for you, delicious. And you are worth it! Soak beans overnight in water. Drain. Heat oil in large pot over medium flame. Add onions and garlic. Cook until tender, 6-8 minutes; transfer to a bowl. Turn heat to medium high. Working in batches, add mushrooms; cook until golden brown. Transfer batch to bowl, add more oil and cook remaining mushrooms. Return mushrooms and onions to pot and add squash (if fresh/raw), beans, bay leaf and stock. Season with pepper. Bring to boil, reduce to simmer, and cover partially. Cook until beans are tender, about 50-60 minutes. Stir in butternut squash (if frozen) and kale and cook until tender, about 5 minutes more. Season with salt. Per serving: 302 calories; 1 g sat fat; 6 g unsat fat; 0 mg cholest; 49 g carb; 138 mg sodium; 17 g protein. From Whole Living magazine. Lovely. I only *really* learned to cook in the last few years, and I think it had a big part in learning to care for my self. This looks delicious, thank you for sharing it! Cooking from scratch is a luxury, and one in which I’d happily indulge every meal if I could. This soup sounds (and looks) delicious. Thanks for sharing!